Caltech’s Electrical Engineering (EE) Department had its beginnings in the summer of 1910, when Throop Polytechnic Institute (TPI) moved from what is now known as Old Town Pasadena to a 22-acre quiet campus bordered by California Boulevard, Wilson Avenue, San Pasqual Street and Hill Avenue. In 1910, Throop Polytechnic, which became the California Institute of Technology a decade later, offered undergraduate degrees in mechanical, electrical, and civil engineering, but there was no administrative structure, so President James A. B. Scherer, at the behest of Caltech’s founding father George Ellery Hale, invited Royal Sorensen to start up an Electrical Engineering Department. It is fair to say that this was one of the best appointments in Caltech’s history: Sorensen remained the head of EE for more than 40 years and saw his fledgling Department become one of the powerhouses of electrical engineering in the United States. Over the years since its inception, the EE Department has shifted its main research focus several times in line with the demands for new technology in a rapidly changing world—from early work on power engineering, to the war effort, to computing and communications. Pioneering research has led to major technological innovations, spawned other disciplines, and developed vitally important collaborations. EE’s cutting-edge science has endured for a hundred years. In 1910, when Sorensen, a 28-year-old graduate of the University of Colorado, left General Electric in Pittsfield, MA, to start the TPI EE Department, he worked with Scherer, Hale, and chemistry professor Arthur A. Noyes to produce a unique engineering department based on the fundamentals of physics and mathematics. At first, there were only three engineering students—two EE graduate students, and one mechanical engineering student. In 1913, TPI became Throop College of Technology, and Robert Millikan started a few years later (1917) as Director of Physical Research. In 1920, Millikan succeeded Scherer as Chief Executive, and Throop became Caltech. The so-called “Big Three” (Hale, Noyes, and Millikan) drafted a new educational philosophy that emphasized pure science, and Sorensen conceived a plan for graduate study in EE, foreseeing a need for education beyond the traditional baccalaureate degree. By the early 1920s, master’s and doctoral programs in EE had begun, and the achievements of the large group of alumni these produced proved the merits of his concept of emphasizing physics and mathematics. Sorenson was one of the first to realize the importance of a national grid system to distribute electrical power in large-scale and long-distance transmissions and participated in California’s pioneering work on this. In a cooperative venture with the Southern California Edison Company (SCE) in 1923, a high-voltage laboratory was erected on campus (in the location that is now Sloan Mathematics) to solve some of the emergent problems in power transmission. It was the first laboratory in the country to have a million-volt power source, provided by a cascade system of transformers designed by Sorensen himself. The High-Voltage Lab was available for both research and industrial testing and was used to aid SCE in the development of high-voltage transmission lines, to furnish lightning protection of oil storage tanks for the oil industry, and for other research efforts to industrialize Southern California. Shortly after Caltech’s lab was completed, a group of Stanford alumni built the Ryan high-voltage lab at Stanford in 1926, and for several years, Caltech and Stanford became the two outstanding schools in the country in the area of high-voltage work. For a time, Caltech was giving more PhD degrees in Electrical Engineering than MIT. 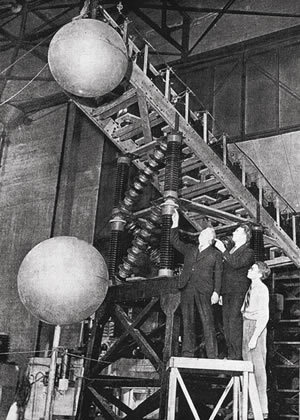 Professor Charles Lauritsen built high-voltage vacuum tubes and EE Professor Francis Maxstadt was involved in the testing of insulators and towers, more so than even Sorensen himself. Professor Stuart Mackeown also spent a lot of time in the High-Voltage Lab. Sorensen’s experiments with high-power current interruption in vacuum, designed to address the serious problems of control and protection of high-voltage power systems, led to his invention of the vacuum switch in 1923, although it was not until 1960 that new technology would make this invention commercially feasible. His original model is on permanent display in the Smithsonian Institute in Washington, D.C. In 1926, EE became part of the Physics and Mathematics Division, as the modern structure of Caltech’s Divisions came into place. William Pickering, a New Zealander, came to Caltech as an EE undergraduate student in the late 1920s, and stayed on to complete a PhD in Physics in 1936. At the time, radio communications and broadcasting were beginning to develop, but the use of electronics in control systems was not yet well known and, as the Department was still heavily oriented toward power engineering, radio communications and vacuum tubes were not considered very important. Mackeown, however, could see the growing importance of this field and urged Millikan to appoint a professor whose research specialty was electronics. Mackeown even offered to sacrifice his own salary for such an appointment. Pickering was the obvious choice and joined the EE faculty shortly after graduating. During this period (1936), the Jet Propulsion Laboratory (JPL) began in Pasadena as the Guggenheim Aeronautical Laboratory, California Institute of Technology (GALCIT) rocket project, led by Professor Theodore von Kármán and financed by Harry Guggenheim. In 1940, the GALCIT group became a rocket research, development, and testing facility. A few years later, a substantial contract from the U.S. Army Air Corps transformed it into the large, permanent laboratory it is now, and its name was changed to JPL. Its purpose was to research, develop, and test missile technology. There was a need for electronics to support missile guidance and tracking systems, and Pickering’s specialization in electronics drew him there. In 1954, he became the director of JPL and remained in that position until 1976. Under his leadership, electronics grew in prominence at the lab, which became a NASA facility in 1958, and work began on a worldwide, civilian satellite communications network, known today as the Deep Space Network (DSN). During the World War II years, Caltech’s EE program was put on hold. 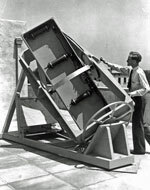 Several faculty members left to take various war jobs, and from 1943 until 1946, Pickering organized a three-year, year-round Navy “V-12” curriculum to meet the military’s need for radar training. 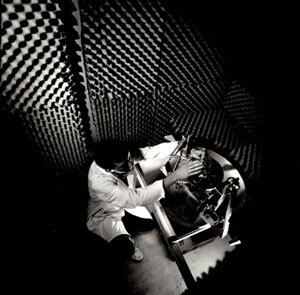 Upon completion of the program, students went to MIT’s Radiation Laboratory (Rad Lab) to study the more specific techniques. Pickering visited the Rad Lab periodically to learn more about the electrical characteristics of waveguides. He also organized and managed the Engineering and Science Management War Training (ESMWT) program, a series of evening courses that were given all around Los Angeles, and personally taught some of the approximately 20 different courses. It was mostly done at the junior college level and was presented at several high schools in the area. The war effort also caused other Caltech faculty to redirect their focus. Gilbert McCann (PhD EE ’39) joined Westinghouse in Pittsburgh to study natural lightning phenomena. But when his research was diverted to support the military, he was set to work devising a way of doing complex engineering calculations using electrical circuits to simulate mechanical forces. This was to become the basis of the analog computer that he invented to do calculations that would previously have taken years. McCann used this computer to design a system for improving the tracking accuracy of anti-aircraft guns, which enabled the British to shoot down almost all the German V-1 bombers crossing England’s eastern coastline. 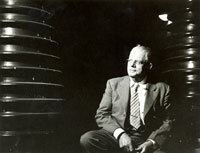 In 1946, McCann left Westinghouse to join Caltech’s EE faculty and began setting up an analysis lab to build an improved version of his analog computer. He negotiated a deal with Westinghouse to make two of everything, so that the duplicate parts were sent to his Caltech lab at a reduced cost. 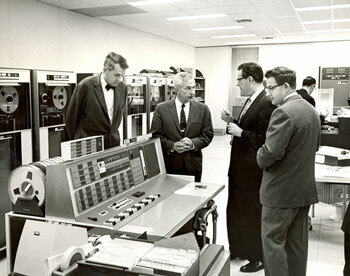 The 33,000-pound computer was assembled with the help of EE professors Charles Wilts (who eventually became interested in control systems) and Bart Locanthi. Their computer became known as Caltech’s “Direct Analogy Electrical Analog Computer,” and it provided service for JPL, the military, and the entire Southern California aerospace industry. The computer was mainly used to solve design analysis problems in the fields of solid mechanics, fluid mechanics, and heat transfer. In particular, methods of structural stress analysis, vibration analysis, and aero-elastic analysis of airframes were developed, the latter carried out primarily by McCann, Wilts, and Richard MacNeal (MS EE ’47, PhD EE ’49). By 1950, the McCann’s lab had become too busy for Caltech. The director of GALCIT, Clark Millikan, suggested spinning off a commercial company, and Computer Engineering Associates (CEA) was formed on Halstead Street in Pasadena. McCann, the largest shareholder, could not run the company since he would have to resign his faculty position to do so, but MacNeal and William Dixon (BS EE ’48, MS EE ’49, PhD EE ’52) became senior managers, and Locanthi was in charge of constructing the computers. They were built primarily for the burgeoning American aircraft industry. Shortly before the spin-off, McCann recruited Stanley Frankel to head a small, innovative digital computing unit. A computer scientist with a PhD in Physics from Berkeley, Frankel had become interested in digital computing during his time at the Manhattan Project in Los Alamos. At Caltech, he worked with graduate student Bernard Alder (PhD EE ’52) on his thesis project—the simulation of the interaction of atoms using statistical mechanics and liquid theory—for which they developed what is now called the Monte Carlo method of statistical analysis. This pioneering work has become essential to a wide range of scientific and technical work, from nuclear weapons development to VLSI chip design. In the 1950s, Frankel designed the logic for a general-purpose “poor man’s computer,” called MINAC. Librascope, a Southern California company located in Glendale, licensed the design from Caltech and hired Frankel and physics graduate student James Cass (MS EE ’53) to turn the design into a production-ready product. Marketed as the LGP-30, it may well be considered to be the first personal computer and is now on display at the Smithsonian Institute and the Computer History Museum in San Jose, CA. Robert Langmuir (PhD Physics ’43) left the General Electric Research Laboratories in New York in 1948 to join the EE faculty and remained there until his retirement in 1980. He had invented and patented a mass spectrometer in 1940 and discovered the radioactive isotope K37. While at General Electric, Langmuir had worked on the development of CW (continuous wave) magnetrons, which were later used by the Navy to jam enemy radar. In 1960, Langmuir participated in the building of the 1.5 BeV synchrotron at Caltech, the first to operate in the United States. He also taught courses in electricity and magnetism, and electronics, while conducting research in various topics in applied physics and engineering. Five years later, in 1953, Lester Field arrived from Stanford, where he had been one of the originators of their electron-tube laboratory. He continued traveling-wave tube work at Caltech, setting up his lab in the basement of Spalding. Field developed several forms of beam plasma and established a tube-research activity that expanded into a group studying plasma physics and microwave interaction with matter. After the microwave-tube era came to an end in the late fifties, his research focused mostly on plasma physics. Charles Papas, who joined the EE faculty a year after Fields (1954), focused his work on electricity and magnetism. In 1965, he wrote a book, Theory of Electromagnetic Wave Propagation, based on his Caltech lectures, in which he presented a number of newly important topics in the theory of electromagnetic wave propagation and antennas in a coherent and simple way, providing evidence that these ideas developed from the Maxwell field equations. David Middlebrook, who joined the EE faculty immediately after gaining a Stanford PhD in 1955, became known as a power electronics icon. In 1970, he founded the Power Electronics Group at Caltech, which developed into an academic discipline. His teaching was widely lauded by both students and colleagues, and in 1997 he was awarded Caltech’s highest teaching award, the Richard P. Feynman Prize for Excellence in Teaching. He had a deep understanding of both power electronics and electronic circuit design and taught analog and power electronics courses both publicly and at Caltech. His seminal book, An Introduction to Junction Transistor Theory, helped engineers understand how to apply transistors in circuit design. His extra-element theorem, which yields simple formulas for the effect of adding a single element to an electronic circuit, is still widely used in circuit design and measurement. This glimpse into the early evolution of Caltech’s EE Department highlights its heritage. Space limitations prevent us from casting a wider net and crediting all those whose work has been a part of this impressive history. Since its beginnings in 1910, the EE Department has laid a strong foundation to support the scientific research and discovery that continues today. Since the 1960s, it has expanded into new areas, such as solid-state circuits and devices, electromagnetics and optics, control, communications and information systems, and networks. It also played a critical role in spawning the Applied Physics, Computer Science, Control and Dynamical Systems, and Computational and Neural Systems Departments at Caltech and retains close ties to these through several joint faculty appointments. Our complementary article highlighting current faculty research interests provides further details. Visit the EE Centennial website.